My posthuman, possibly cyborg, awakening. Well, this penny has taken an awfully long time to drop!! But I guess you don’t go around talking about philosophical paradigms everyday of the week. It’s just when you’re engaged in PhD research you’re more or less expected to situate your research in one. Having said that, I now recall that posthumanism was pretty much the focus of #EDCMOOC, e-Learning and Digital Cultures, that I did way-back-when, when I said I’d “forgo any attempt at putting my thoughts down about ‘redefining the human’ and the implications for education of such a paradigm shift”. Well, it looks like I can’t duck that one any longer as my focus of study, selfOER, seems to be increasingly pushing me in that direction and to consider what it means to ‘be open’ and indeed to ‘be human’. As you may know, I’ve already conceived my research topic, the practice of selfOER, from a sociomaterial literacies perspective and as a sociomaterial assemblage, that is a relational coming together of human and non-human actors in an actor-network theory (ANT) way of thinking. Because I’m interested in how selfOER gets enacted and how subjectivity of the self is constructed, not only materially but discursively as well, I’m also drawing on Foucault who, because of his critique of structuralism and it’s focus on language, often gets labelled as a poststructuralist. Indeed, ANT can also be considered in poststructuralist terms, so it’s no wonder that I didn’t see the posthuman, or the cyborg, coming sooner. 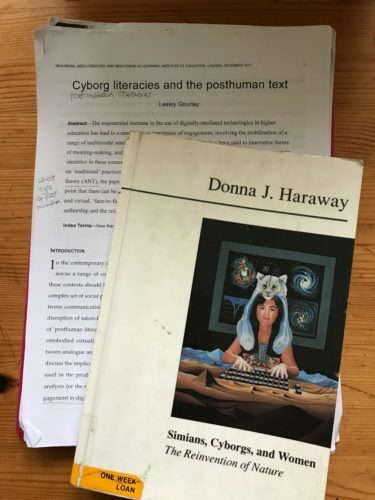 It was rediscovering ‘Cyborg Literacies and the Posthuman Text’ by Lesley Gourlay (2011) that stirred this deeply sown seed and prompted my turn to the posthuman. And I have to say that the omens are looking good because hadn’t I just checked out a copy of ‘Simians, Cyborgs and Women’ (Haraway, 1991) when Bonnie Stewart, in her awesome keynote at ALT earlier in the week, calls out Haraway’s cyborg as a possible way to understand the relationship between technology and open practices and perhaps as a way to deal with the political implications. Clearly, I’ve got a lot of reading ahead of me in order to understand how such a theoretical orientation can be applied to my research and help understand what’s happening in practice. However, it’s fascinating, not least because it requires a lot of recalibrating of previously held assumptions. So, how/why does posthumanism redefine the human, and what are the implications for digital and open education? Quickly, drawing on thinking from poststructuralism, feminism and science and technology studies, posthumanism builds on critique of the humanist project that’s underpinned much of Western thinking for over the last 400 years or so and calls into question what it is we mean when we speak of the human. 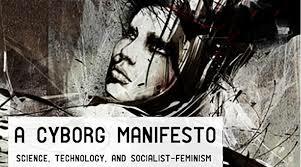 In particular, it de-privileges the human and considers them alongside nature and the technological other, and in doing so it brings into question the essentialism and autonomy of the human subject, which in turn has implications for how we view human agency. There are a number of reasons why humanism is being called into question. These range from the ‘Death of Man’ thesis in which Foucault asks whether we are closer to gods or to apes; the generic postmodern/feminist critique that sees humanism as a mechanism of elite white male hegemony and the ecological critique that considers actions predicated on humanist assumptions as destroying the planet etc. Indeed, in the last 12 months or so, the anthropocene has been declared, which proposes a new epoch dating from the commencement of significant (detrimental) human impact on the Earth’s geology and ecosystems. Equally, with the rise of artificial intelligence and accelerating technological mediation, what it means to be human is also being questioned. Mind you, as Professor Steve Fuller points out, ‘it is very difficult to define what it is to be human’. It turns out that ‘humanity’, as a social category, has variously been defined throughout the ages (ancient, medieval and modern). In relation to education then, the implications of this discussion and the critique of humanism are clearly profound. Rather than ‘bringing out’ the potential of the individual subject (Biesta, 1998), it may well be that education, viewed in terms of assemblages, is more about ensuring the creative ‘gathering’ of human and non-human actors (Edwards, 2010). Therefore, as Sian Bayne (2016) asks, “how, as researchers and scholars, can we move beyond the humanistic orthodoxies which assume the individual – the human subject – to be a rational actor in possession of a pure agency which allows it to view the world from a position of autonomy and disconnection from its material and discursive contexts?” (p.83). Well, I don’t know, but it would seem that I’m about to start giving it a go! Defining Humanity (2009) [Film]. University of Warwick, TEDX. Haraway, D. (1991) Simians, Cyborgs and Women: The Reinvention of Nature, London, Free Association Books.